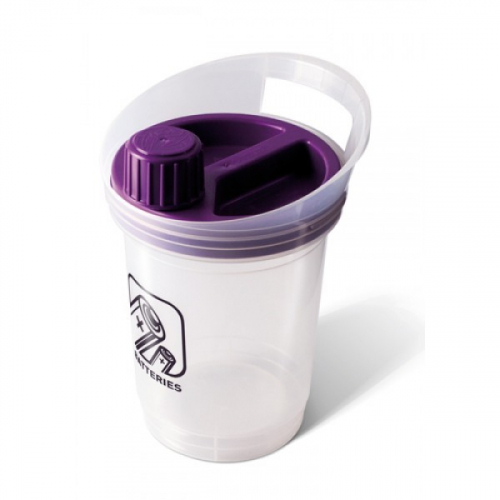 This mini battery recycling bin features a purple lid and battery graphic which helps the bin to be easily identified. Its shape and size make it ideal for mounting on a shelf or desk. It is commonly used in supermarkets, shops and offices. Constructed from polypropylene, this bin is designed with a handle at the top for easy lifting. The body of the bin is semi-translucent to make ease of monitoring the contents. Batteries are deposited in through a small twist-off lid within the lid. To empty the bin, twist the full purple lid until it comes off. The screw-top lid also ensures the contents remain secure should the bin fall or get moved.